Design: The flooring in the entire department is coated with epoxy with a clear coat of polyurethane in order to have an impervious microbe resistant floor. The walls of entire department is treated with water base epoxy primer and finally with polyurethane paint. HVAC System: Positive air pressures are maintained in the air lock between the primary corridor and department to ensure that outside air does not enter into manufacturing area. Design of AHU of the powder department is made as to maintain the RH between 35-40 and temperature 22°+/-1%. Air supplied to powder department section is filtered through 10µ filter and 5µ filter and terminal HEPA filter of .3 µ to achieve class 10000. Class 10000 is comprises of air changes of 30 and particle count for viable and non-viable and DOP test, 10% fresh air is used. Manufacturing: Separate area for drying of material is provided with 48 try Steam heated try dryer. Manufacturing area is equipped with 36" Vibro sifter, Pulveriser, 200 litre capacity planetary blender. Separate area is providing for blending of material with 1200 litre octagonal blender. Filling Machine: For pouch filling of powder five no. of volumetric form fill seal (FFS) machine are equipped. Coding of batch is done with ink jet printer. 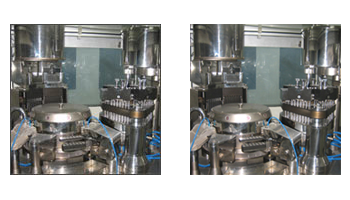 For dry powder bottle filling separate automatic powder filling and packaging line is equipped.